Said Shaiye, an English to Somali medical interpreter. Photo by Annabelle Marcovici. Choy started interpreting for his family after they arrived in the U.S. from Guatemala. He was seven years old. Like many other migrant children in America, once he was enrolled in an English-speaking school, he learned the language much faster than his parents. “I became their personal interpreter,” he said. “I was the family go-to.” Helping adults in his family navigate through various systems was a heavy burden for a child, but by the time he grew up, Choy realized he wanted to do it for a living. Certification and skill tests from bodies such as the International Medical Interpreters Association and the Commission for Healthcare Interpreters are voluntary. Still, Choy takes the written and oral exams every four years, which cost him around $400 each time, for his own professional development. This continuing education is crucial for Choy, helping him learn updated terminology in both languages as medical developments continue to advance. But he has no direct financial incentive to complete the certifications, and he claims the collective quality of his workforce is worse because of it. “If the industry would say, ‘We’re going to pay them more,’ that would entice people to better themselves, but it doesn’t,” Choy said. This is one of the reasons why he’s considering leaving medical interpreting after eight years on the job. It’s not the only one – anyone willing to pay the $50 fee can register on the Minnesota Department of Health’s medical interpreter roster maintained by the state, which employers use to find workers, but it’s up to the agencies and hospitals hiring to vet each one. Sometimes they don’t, said Choy and his wife Karen, who works as an interpreter on staff at the University of Minnesota Medical Center. All medical interpreters must complete a 40-hour training to qualify to work, which typically costs upwards of $500 to attend. Many of the classes are offered online by private companies and cover ethics, confidentiality and non-English medical terminology. Some medical interpreters like Mauricio Montes de Oca, who also works for the University of Minnesota Medical Center, insist that the training covers only the basics and isn’t adequate enough for the job on its own. Pay for medical interpreters varies; agencies pay interpreters an hourly rate per each medical appointment and can offer a per-hour dollar rate in the mid-teens. In these cases, it’s common for the per-hour rate to decrease if a meeting lasts longer than an hour. To Montes de Oca and others, this pay rate isn’t enough for the complexity of cases that medical interpreters take on, especially considering the significant amount of money moving through the healthcare industry. Medical interpreters who work at Hennepin Healthcare, which recently changed its name from Hennepin County Medical Center, make between $23.39-$29.80 per hour, according to their current bargaining contract. Montes de Oca said this is roughly $4 to $5 per hour more on average than interpreters make where he works, and he attributes this to the fact that the Hennepin Healthcare-based interpreters are the only unionized medical interpreters working in the state. It’s a part of the practice where medical interpreters become what Choy calls “cultural brokers.” Though this role is crucial to interpretation, it is often undermined due to the medical interpreting industry’s “black box” business model. According to interpreter Kristin Gannett-Sánchez in a 2013 article for American Translators Association, the black box model prioritizes “linguistic conversion of the message” over existing “cultural nuances” between patient and provider. Because of this model, the process of interpretation between patient and interpreter and can feel stressful and lacking in cultural sensitivity. But if, for example, interpreters feel a doctor is wrongly telling the patient that their headache will go away on its own, they cannot step in and object. Choy also won’t interfere with a patient who he knows is lying to the doctor about something, such as taking their medication when they’re actually not doing so. Medical interpreters can feel conflicted in situations like this, especially when something seems lost in translation. When there’s obvious confusion between the patient and doctor, interpreters jump in. But if a patient asks the interpreter to repeat what the doctor said after the appointment is over and the doctor is gone, the interpreter can’t respond. Choy tries to mitigate situations like these by holding an introduction session with patients before their medical appointments when he can. During the sessions, he instructs them not to tell the doctor anything they don’t want to disclose and to repeat their statements if they have a hard time understanding the doctor. All of this is meant to empower the patient, who stands to gain or lose the most during the appointment. The precariousness of the industry also made Said Shaiye unsure of his future in medical interpreting until he landed a full-time job at Children’s Hospitals and Clinics of Minnesota. 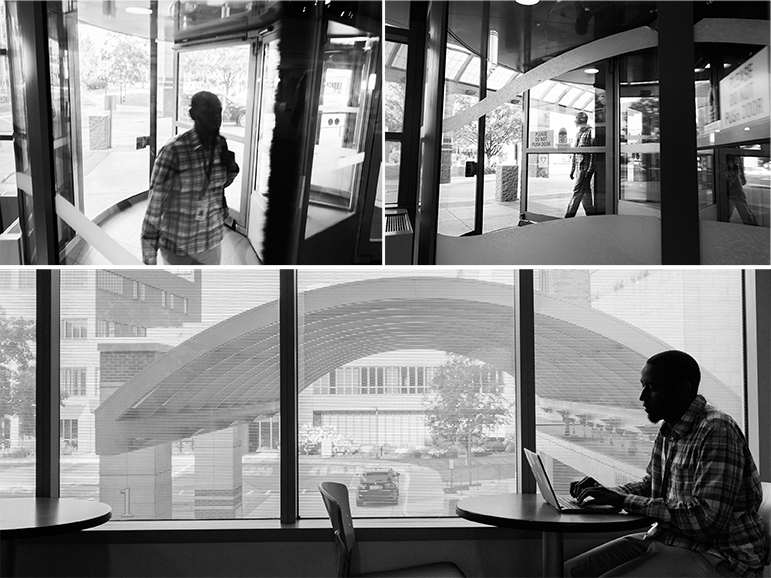 Before then, he spent the past year working freelance in the Twin Cities for agencies like Kim Tong and Intelligere. Shaiye, who translates between English and Somali, said the job’s biggest reward is the impact he makes on patients’ health and safety. The work also helped his understanding of his own identity and background, which he said made him emotionally and personally embedded in it. Talking to a medical professional, Shaiye emphasized, is a way for patients to share experiences and stories that they might not have otherwise talked about with their families. “It’s taught me a lot about myself, and my family and who I am as a person,” he said. Shaiye grew up in Seattle and studied Somali intensively when he traveled to Somalia from 2013 to 2016. At the time, his father gave him a medical dictionary, which helped prepare him for the job. When Shaiye started medical interpreting, sometimes Somali-speaking patients wouldn’t immediately trust him because of his American accent. That would happen when a patient’s family member who was fluent in both English and Somali would attempt to do the interpreting work for him. “Even if it’s spoken correctly and grammatically correct, I think the accent is enough of a distractor that some people put me in the outsider box and try to ‘other’ me a little,” Shaiye said. But it was the working conditions that made freelancing job impractical to Shaiye. Scheduling a full workweek and travel between hospitals and clinics for each appointment posed several challenges. He regularly took the hit for patient no-shows. When his work expenses grew, he was told to write them off on his yearly income tax return instead of getting reimbursed for them by his employer. “If all of my expenses are almost exceeding my income, what’s the point? I’m not even going to make it to tax time,” Shaiye said. Said Shaiye works at a medical center. Photos by Annabelle Marcovici. He argues all of this could be solved with simple industry-wide measures in place, like standard pay across the board. Choy, for his part, emphasized that he’d like to see medical interpreter standards raised to a level similar to American Sign Language interpreters, who are often required by employers to hold bachelor’s degrees and be certified to work by the Registry of Interpreters for the Deaf, to help professionalize the industry more. Increased professionalization in the form of occupational licensing and requiring a bachelor’s degree could limit indigenous speakers’ collective access to entering the profession as a means to generate income with skills they already possess. It was difficult for Shaiye to take the initial 40-hour required class to enter the profession and he said he lucked out when he got a scholarship to pay for part of it. 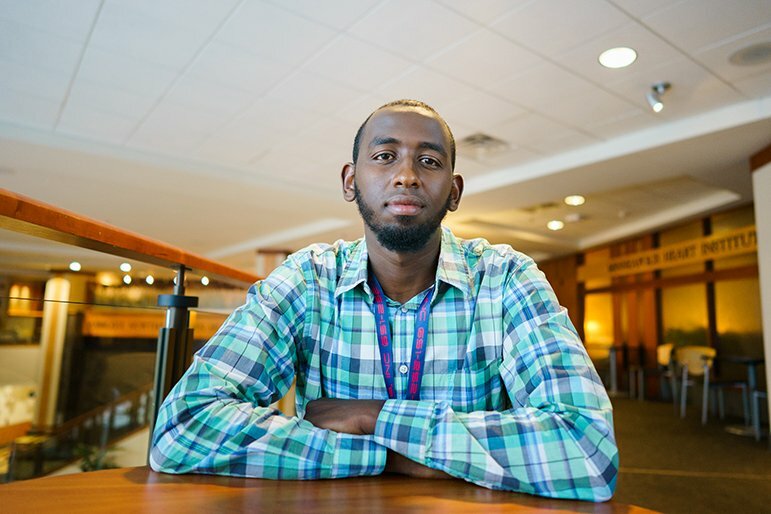 Shaiye said his new hospital job is “a much different situation”— his workplace incentivizes this kind of continuing education and offers a structured path for its workers. Similarly, medical interpreters at Hennepin Healthcare, who number around 130 employees and are unionized through the Minnesota Newspaper and Communication Guild, were able to win concessions on these issues during contract negotiations with their management. Per the current bargaining contract, Hennepin Healthcare interpreters with advanced certifications get paid more and because they’re written in the bargaining contract, the rules can’t change overnight or at the whim of management. These professional standards make interpreter jobs at the county hospital some of the more competitive medical interpreter jobs in the region, according to the union. “It doesn’t guarantee that we’re going to get everything we want, but we have a voice,” said Santiago Morgan, who’s worked as an interpreter at Hennepin Healthcare and has been active in the union for the past two decades. Plenty of roadblocks lie in the way of organizing the rest of the state’s medical interpreters. A recent effort at the University of Minnesota Hospital failed after the hospital ordered interpreters to organize with other job classes. Management successfully limited the medical interpreters to joining unions already representing other job classes at the hospital, which didn’t apply to the Newspaper Guild, who was helping to drive the effort. The union is experimenting with other ways to organize interpreters. Newspaper Guild organizer Rica Highers works with a group called Lingua, which is affiliated with the union but doesn’t have the power that comes with collective bargaining for higher wages and benefits. Freelance court interpreters in the Twin Cities formed Lingua three years ago to address workplace conditions. Since then, the group has advocated directly to the Minnesota Judicial Branch for higher wages, but hasn’t yet been completely successful. Lingua did, however, score minor victories like increases to parking reimbursement for its workers. Right now the group is looking at organizing court interpreters through forming a cooperative, a scenario that Highers said could be as powerful as collective bargaining rights since the interpreters would own their own work. But medical interpreters aren’t yet directly joined in the effort, and in the meantime the industry risks losing people like Choy. The quality of the interpreter workforce affects patients “big time,” Choy emphasized, and one of the consequences of poor interpreting is patients needing to schedule and pay for a new appointment. “Others forget [to make another appointment] altogether,” Choy said. Excellent article, one thing that it’s important to mention is that there have been several tries to create a true registry through the legislation (what we have now is a roster list not a registry) that would have levels depending on the qualification, but it didn’t pass because politicians are always more concerned on getting votes instead of doing what it’s right. [Chart from Department of Health and Human Services.] Compared to American overall teen pregnancy rates, Asian girls have much higher teen pregnancy rate. Here are facts which may contribute to higher teen pregnancy rate among Asian girls in Minnesota.